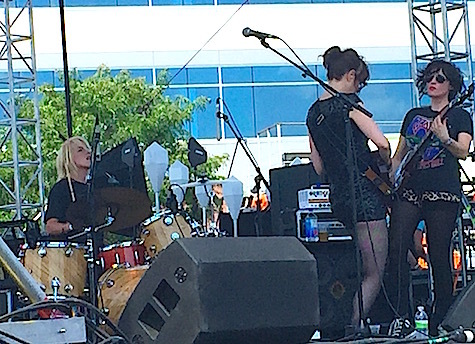 Ex Hex on the Maha Music Festival main stage, 8/15/15. The band returns Saturday at Reverb Lounge. Winter hasn’t finished with us yet. Weather-wise, another a crappy weekend; show-wise, the selection is limited but pretty good. Tonight Nightmarathons headline way out west at Dr. Jack’s Drinkery, a place I’ve yet to visit located at 3012 No. 102nd St., which (I think) used to be the old Brass Knocker? Someone help me here. I lived right down the street from there for years when I was in college. Anyway, the Pittsburgh band plays punk pop/emo with lots o’ group vocals and rock riffs a la The Get Up Kids. Like I said, an emo band. Opening is Omaha pop-punters HeatWaves and Speedball Summer. $8, 9 p.m.
That’s it for Friday, but there are two awesome shows Saturday night. Mary Timony’s band Ex Hex headlines at Reverb Saturday night. Their new album, It’s Real, just dropped via Merge Records and is a straight-up old-school rock album, or as Pitchfork said in this 7.8 rated review: “This time, they mine the denim-clad AOR of Billy Squier and Foreigner.” Yeah, this sounds very ’80s FM radio rock. Opening is Sub Pop band Moaning, an LA DIY post-punk trio. $18, 9 p.m.
Also Saturday night, Lodgings headlines at The Brothers Lounge. The band has been working on a new record, which they’ll likely preview. Opening is Bed Rest and Relax, It’s Science. $5, 9 p.m. Finally Sunday night Louisiana band Ghost Foot headlines at The Sydney in Benson. Joining them are Lincoln’s Universe Contest and The Natural States. $5, 10 p.m.
Wrong Pets at O’Leaver’s Oct. 21, 2016. The band returns to O’Leaver’s tonight. Lots of shows happening tonight; not much the rest of the weekend. Let’s start with the show at The Waiting Room: Drive-By Truckers. The Athens band that’s been kicking it since the late-’90s is out supporting their latest release, American Band (2016, ATO). I gotta believe they’ll be playing some new stuff tonight. Joining them is our very own High Up. $30, 9 p.m. Meanwhile, over at The Brothers Lounge, Digital Leather headlines with Cult Play and Satanic Abortion. $5, 10 p.m. The Sydney tonight has Shreveport band Ghost Foot along with Rusty Lord, Lincoln act Sweats and a late-night DJ set by David Nance. $5, 10 p.m. 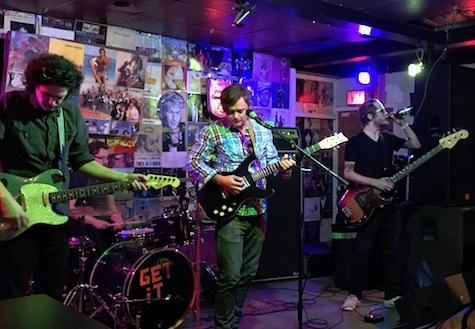 Finally, Wrong Pets, the band fronted by Reagan Roeder with Landon Hedges (bass), Danny Maxwell (guitar) and Ryan Haas on drums, opens tonight for a Nirvana cover band at fabulous O’Leaver’s. $5, 10 p.m. Tomorrow night (Saturday) Guster returns to The Slowdown. Their latest is Evermotion (2015, Nettwerk). Van William a.k.a. Van Pierszalowski of the band Waters opens. He’s been opening for First Aid Kit on thier 2018 tour. 8:30 p.m. $28 Adv/$30 DOS. 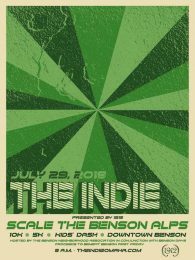 The Indie is Sunday morning in Benson. I’ll be skipping Guster this time because I’ll be running in The Indie Sunday morning in Benson. It’s arguably the toughest urban 5k/10k event in the area, boasting a course consisting of one insane hill after another — they don’t call them the Alps of Benson for nothing. It also has the coolest trophies of any local races — winners take home gold records. You can register for the run right up ’til the day of the event. Registration is taking place today at 1912 in Benson from 3 to 7 p.m., tomorrow at the 1912 booth at Benson Days after the parade, and the day of the run starting at 7 a.m. Those who register will receive a handsome Indie shirt designed by Pat Oakes of Ink Tank while supplies last. Race start time is 8 a.m. Sunday at 60th and Maple. For more information, go to theindieomaha.org.